When it comes to mixing audio, there are many variables for how the final product will turn out. How good are the recorded tracks? How accurate are your studio monitors? Is your room acoustically treated? How much experience do you have mixing? Etc. But one simple and effective tip I can suggest is simply to mix at a lower volume. To be honest we tend to like our mixes when we crank the volume. The drums are hitting hard, the bass seems huge, and the vocals and guitars just soar right out of the speakers. But the moment we turn the mix down in our cars or on our iPods it all falls apart. Things sound weak, flat, and boring. Why? What happens when we mix at higher volumes is we have an inaccurate picture of our mix. Certain frequencies can sound more apparent at higher volumes, and this tricks your ear. If you think the kick drum is coming through just fine then you may not EQ and compress it to actually cut through the mix at a normal listening level and thus it disappears for most listeners. So my suggestion to you is this: turn your monitors down to a volume level low enough to allow for light conversation in the room. What ever volume you think wouldn’t overpower you hearing someone else comment on the mix. Use this as a starting point and mix from there. Your tendency will be to want to crank it up to rock out, but fight for as long as you can. Every once in a while you should turn it up just to make sure the bass is working (as it’s hard to get that right at low volumes alone). But for the most part, force yourself to make your mix pop and have punch at a lower volume. The other main benefit to mixing at lower levels is you both protect your hearing and you slow down ear fatigue. This keeps your ears fresh and reliable so you can mix more accurately for longer periods of time. Kind of a no brainer if you ask me! So remember, almost anything sounds great when you crank it. So don’t short change yourself, instead turn your mix down while you work and get it to sound great. such good advice. i’m going to start making this my m.o. and i would add–don’t forget to wear earplugs at shows! i suffer from pretty bad tinnitus and you DON’T want it too, peeps. Great advice indeed. Pretty odd actually that just last evening, i was showing (off) a track i recorded to some friends. one of them was a “oooh, turn it down, will you?” kind of a chap.. and when we did turn it down, he (who probably knows nothing about recording or mixing) said “the vocals are so loud that you cant hear much of the music”. And he was right. it all sounded pretty neat when cranked up.. but everything seemed very different at lower levels. You’re right guys. Protect your hearing at all costs. And yes, I’ve learned this lesson (of mixing at low volumes) the hard way. 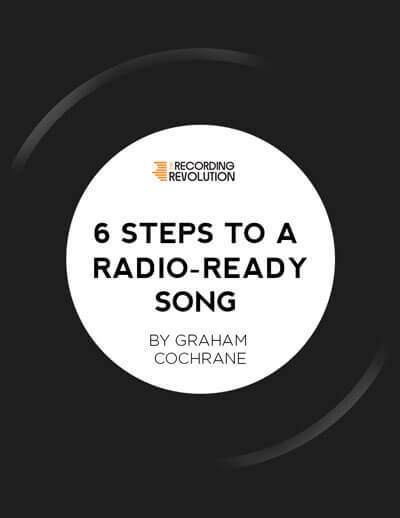 This is very good advice as always Graham! I’ve heard from top engineers that having a Sound Level Meter handy (you can get one at Radio Shack for around $30) and setting your monitor levels around 83-85 dB will give you the flattest frequency curve of human hearing. This is all according to the Fletcher and Munson curves. I use ‘pink noise’ to EQ my main outputs to get a flat response on my monitors and then every now and then while mixing I double check my monitoring levels to ensure I’m within 83-85dB. Keep up the good work Graham! How exactly do you tune your speakers with pink noise? Can’t seem to find the info. I got an spl meter…. Do you need an omni mic to pick up the room noise? How and where do you eq the monitors? Luis, thank you for the information. What SPL meter are you using on your iPad? Also, are you setting the level using pink noise at your listening position? One more question,.im using Sonar. Where can I download pink noise or what plugin can be used that’s free. Thank you for your time. You can demo it for 60 days fully functional. I’ve been trying it with a pair of Sennheiser HD 280 pro headphones at very comfortable levels. No ear fatigue and pretty darn good results!!! Sorry I forgot! Regarding my first post above, I meant to mention that you can get pink noise free in Pro Tools (tone generator plugin) and if you have a smart phone like the iPhone you can get a Sound Level Meter app for free as well! As a matter of fact, that’s what I use:-) And as I said… my mixes translate very well every where I play them and btw. Also, I don’t have acoustic treatment at all; it’s all done in an actual bedroom in a little corner. This is an excellent way to ‘tune your room’ and get the most out of your monitors (pretty decently and… for free! @Luis – some great suggestions! I’m sure everyone will benefit from looking into them. Great article. My room is not treated that well. I find that mixing at lower levels reacts less with the room. My mixes are mor accurate. Its rumored that Nirvana Nevermind was mixed at whisper levels. If you really learn how to tweak it and pay attention and compare to your actual monitor. boombox is also easy to use and quite portable unlike other speakers and docks out there. Very good advice. Iv ALWAYS been concious of my hearing, and have even gotten my co-workers to lessen the systems in their cars so they can hear better in the studio. Yes, I heard CLA saying once that if a mix sounds good in low volume, it will sound great on high volume. Hello! I have one (stupid) question, please. Is there any plugin or hardware that can improve (fletcher munson curve) frequency while mixing on low levels. Some kind of exciter/enhancer or upward compressor maybe? I want to avoid my untreated listening room as much as I can before I buy headphones. There are plugins like ARC from IK Multimedia that are “room correction” plugins. But nothing will “fix” the way your ear perceives more bass from the louder volume. my room is not 100% acoustically treated , mixing in lower volumes may decrease the amount of reflections in the room which makes it easier for hearing the speakers and not the room ? This is an older thread, but I would like to try setting the listening or mixing level using an SPL meter. I have an IPad. There are a few downloadable apps that I can use. Also, I’ll need to download pink noise. The question is, do I test using the SPL meter on each speaker (one at a time) or just test both at the same time? Also, I’m sure I have to test at ear height at my mixing chair? Is this the correct way to do this? 83-85db. I would assume, 83 is the adverage and – 85 is the peak? Please explain. Thank you..
Or do I just play the track I’m mixing and check it with the SPL meter? maybe it is interesting to mention the Equal-loudness contours are often referred to as “Fletcher-Munson” curves? That should exactly be it what you are talking about here.